Hiranyakashyapa, the demon king wants to kill Lord Vishnu who killed his brother Hiranyaksha. Hiranyakashyapa begets a different boon from Lord Brahma that he could not be killed by any weapon, by any human or animal, on land or on water or on air, not in the day, nor in the night. With the help of such a powerful boon, he defeats Devendra the king of heaven, made the Astadikpalakas (The eight guardians of the directions) his servants and propagated himself as God. With the intervention of the sage Narada. The son of Hirnyakasyapa born with prenatal wisdom and devotion for Lord Vishnu. 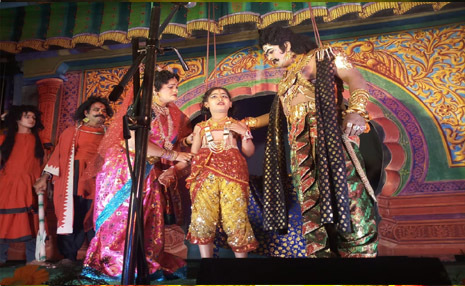 Hiranyakashyapa tries to change his son away of the devotion of Lord Vishnu. Hiranyakashyapa tries his son first with love. When he failed, he tries with fearful punishments. Prahlada is thrown from the hill, pushed into fire, thrown into the seas, thrown in front of violent elephants, hanged and poisoned. But Prahlada keeps on surviving from all the punishments by the grace of Lord Vishnu. Even after many punishments, Prahlada refuses to give up his devotion for Lord Vishnu. One day, got sick with the arguments with his son, Hiranyakashyapa asks his son Prahlada to show Lord Vishnu if the Lord has courage enough to face him. Prahlada relies in a different manner that one can find Lord Vishnu anywhere and everywhere since he is omnipresent. The enraged Hiranyakashyapa compels Prahlada to show his Lord in a pillar and breaks it with his mace. From the broken pillar, miraculously, Narasimhavathara, the incarnation Human-Lion comes out. Narasimha lifts Hiranyakashyapa, places the king him on his lap on the threshold, at sunset and kills Hiranyakashyapa with his nails piercing into stomach.